We cater for students who want to pursue a traditional blend of pure and applied mathematics and/or statistics and for students who already wish to specialise. Our bespoke degrees include BSc Financial Mathematics, for graduates looking for careers in banking and finance, and BSc/MMath Mathematical and Theoretical Physics, for those wishing to combine these two closely-related and complementary subjects. The newest addition to our portfolio is a BSc in Data Science, taught jointly with the Department of Computer Science, which gives graduates the skills to help industry deal with “big data”. Details of all of these programmes and their respective entry requirements can be found on the university website and on UCAS. Data Science is an example of a course that can be taken with an “integrated year in industry”: between the second and third taught year, we help you to find an industrial placement where you can develop and apply practical skills related to your learning. It is also an example of the flexibility that we offer to combine the study of mathematics with other subjects. We provide many joint degrees and major-minor degrees both with other sciences or with a language, education, or business and finance. Opportunities also exist to study Mathematics in Welsh. The Department of Mathematics offers outstanding teaching and high levels of student satisfaction. We are first in the UK for teaching quality in Mathematics (The Times & Sunday Times Good University Guide 2018) and third in the UK for satisfaction with “Teaching on my Course” for the subject of Mathematics and Statistics (NSS 2017). 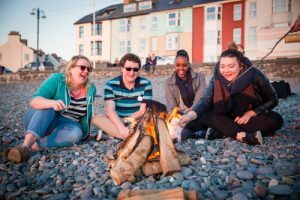 Aberystwyth University is located in mid-Wales, between the beaches of Cardigan bay and the Cambrian Mountains. Aberystwyth is a lively university town with a quirky feel. It is also one of the safest towns in the UK and recently voted a “Great Town” by the Academy of Urbanism. With a direct train service to West Midlands, the town has a thriving student population and a wealth of restaurants, cafés, and a lively nightlife.